When you see the Chemical Brothers live you quickly realize the two distinct versions that rush at you from the moniker’s sibling alchemy; the intimate all-by-yourself-with-a-pair-of-headphones cochlea-stimulating album version and the live double impact visually and sonically stimulating version. Both are euphoric pleasurefests in their own right and the Brothers latest album We Are the Night shows again why on album and live they’re considered masters taking their recordings to levels rarely matched at a live concert. Adding more beads of sweat to the bodies packed into the humid and muggy Riviera Theatre, UK new wave quartet Ladytron greeted the Chicago crowd and let loose triple layers of resonating bass that coalesced into a low meditative grind of hi and low frequencies that slip in and out of a crisp and surging combo of precise electro beats and live pounding drums. Their performance was an entrancing stylistic duet of dark and dreary Edgar Allen Poe and an alluring character from a Nathanial Hawthorne short story. Ladytron was both sensual and furious; catching me completely off guard, touching a dark and pleasurable side that I didn’t expected to be uncovered when I came through the Riviera’s front doors. 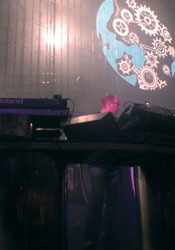 Now, what the Chemical Brothers pumped from the speakers at the Riviera was a mix of reworked techno and hip hop beats from We are the Night combined with the mind-blowing 50 ft video screen that flashed surrealistic animation. What makes the live Chemical Brothers so exhilarating, more than just a rave, is that they know exactly how to turn your body’s subconscious symphony of homeostasis —the low frequency loops of your heartbeat and blood flow—into gigantic electronic waves of digitized multi-dimensional tempos and rhythms, bursting from triple-stacked speakers and rushing over you until you’re floating in a sea of big beat oblivion. After the post-show oblivion subsided, I realized that by the third song “Do It Again” my usual mode of sonic intake had gone all goofy. My eyes became my mouth, my ears became my eyes and my mouth was just there slung wide open taking in whatever was leftover from the sensory carnival that is the Chemical Brothers. For most of the night there were no vocals as the Riviera pulsed with electro sirens and the relentless visually stimulating tsunami poured from the speakers, plastering pleasure grins on faces of fans who closed their eyes, kicked back their heads, letting the euphoric beats wash over them. The Brothers darted around stage in between twisting knobs and flipping switches, demanding playfully that the crowd feed them more energy. For almost two hours the roar of the crowd surged and swelled and then broke loose with the push-pull from building instrumental verses that gave way to slingshot choruses that flung the masses into bursts of green-lasered nightshine. “You are all my children now,” said the Chemical Brothers as they channeled a final hypnotic message and a welcome fate through a more evil version of the “Galvanized” clown from the video screen during the last moments of the show.